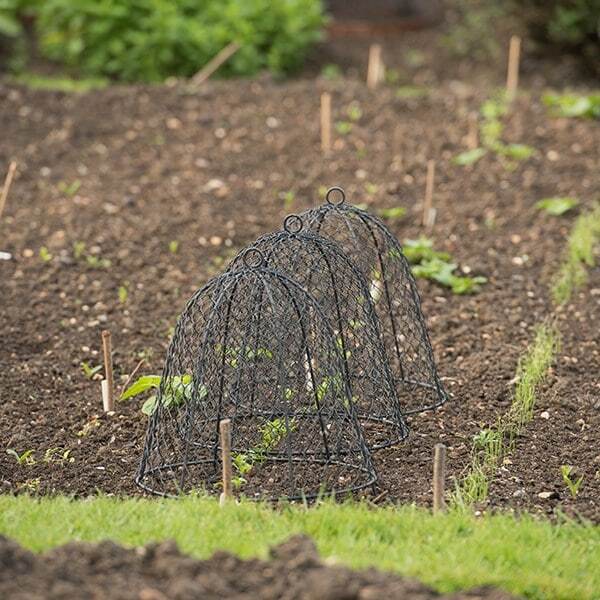 These dome shaped cloches keep hungry deer, birds and rabbits away from your precious crops. In urban gardens they are very useful for stopping dogs (or foxes!) trampling on your young, precious plants. The three spiked feet can be pushed into the ground to help anchor the cloche in position, while the ring on top makes them very easy to lift and move around. They are also large enough to fit over pots on the patio or blend in beautifully into a border. Produced from steel rod and wire finished in a protective matt grey powder coat. Very useful to keep pigeons off pots of plants and chickens off a young hydrangea. Unobtrusive. Quick and easy to move when necessary. Good value. Very little works on my roof terrace when it comes to squirrel proofing, so this cloche offers a tiny but welcome squirrel free zone. I bought this cloche to protect my parsley from the wood pigeons. The small cloche that I ordered fits the parsley pot perfectly and the woodies haven't been able to touch the parsley since. It's sturdy and attractive to boot. 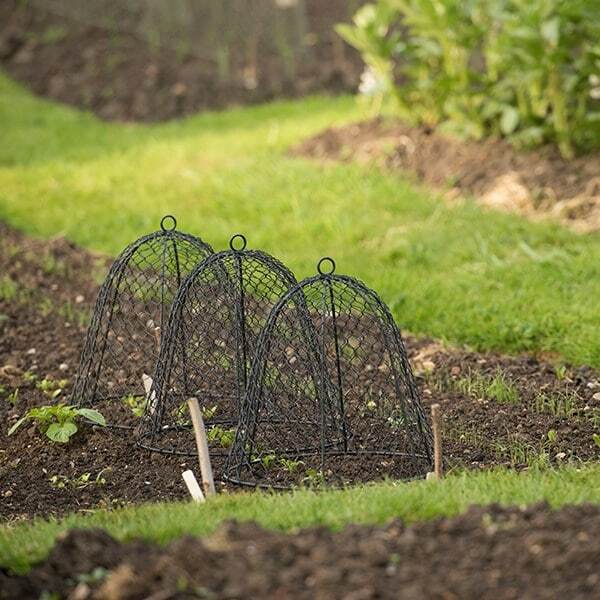 I like this cloche so much I will be ordering another one soon to protect my tarragon (also loved by the woodies). Useful and attractive as long as you don't mind the rusty look (it will rust). especially brilliant when I need to put slug pellets down I use this frame over the pellets and plant to protect the hedgehogs that visit my garden. This is excellent for protecting young plants or plants at a vulnerable stage of growth. It seems to have deterred urban foxes as well as squirrels from that heartbreaking destruction. You can't cover your garden with them but you can have peace of mind for new or prized specimens. 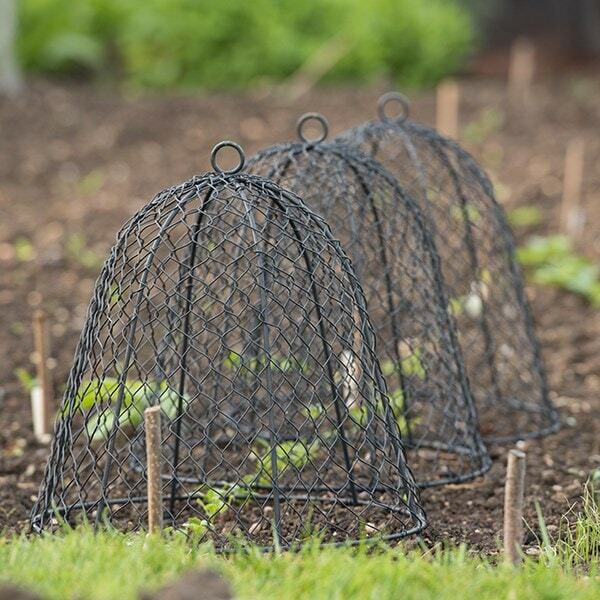 Not only do these cloches look good but their sturdy construction provide excellent protection, not only from the rabbits that plague my garden but also, from my ducks, chickens and turkeys. The cloches arrived promptly and well packaged. Excellent product and 5* customer service. I don't actually have a garden, just a balcony so squirrels, and other wild animals, are not really a problem. However, I do have a cat who longs to be outdoors, and thinks that any exposed bit of soil in my pots and planters are there for his personal use. 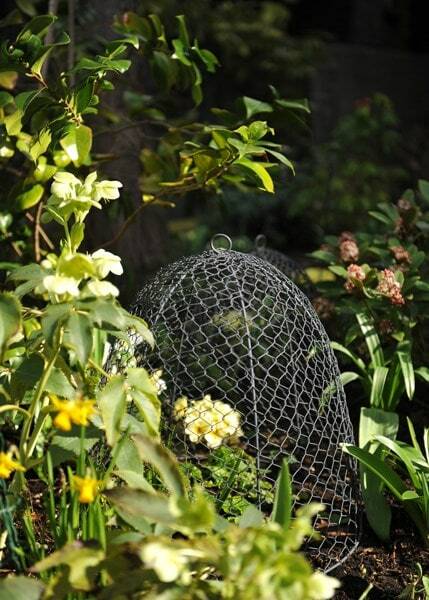 The cloches are an efficient and pretty way to fend my plants from the cat's unwanted attentions! They do the job, and so far, they seem to take on our wet climate without any wear. 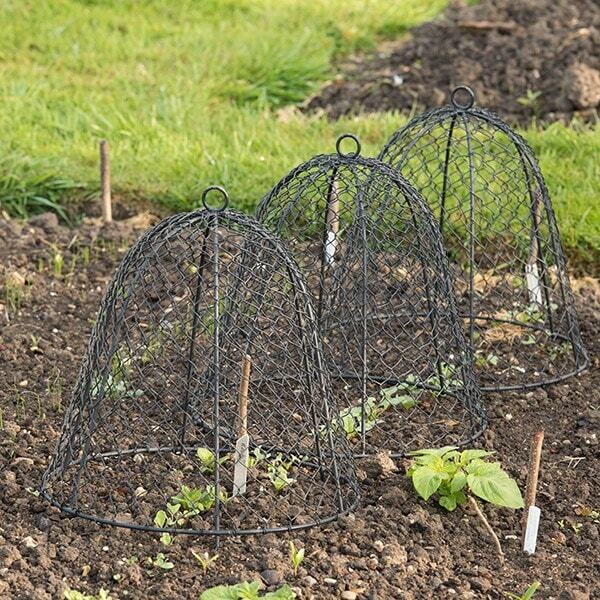 Most of the cloches are quite slim. Some shrubs are wider and the deer still nibble any foliage protruding out of the cloche. My problem is deer and not squirrel- they eat all lower shoots. I am considering buy the Squirrel Proof Cloche. Does the height of 48cm include the spikes or is it just from the circular base upwards? Hello there. The height of the larger cloche is 45cm from base to top (50cm including the feet). We've amended the description to clarify. Thanks for bringing it to our attention.